Ever since I learned to read and love it, I wanted to write. Life kept getting in the way and it is only now I’ve had the disc...ipline and the opportunity to write. Now I can’t stop! It’s the best buzz I know (apart from the obvious!) Writing a good book is as enjoyable as reading one. You get lost in that world. It isn’t easy but it is a bit wonderful. I find I have to go into a sort of meditational trance, get behind the eyes of the character whose point of view I’m in and live the story with them. I hope I can keep writing until I fall off my perch! Peace Lily was published last month. It is the sequel to Daffodils, a tender love story in WW1, and follows the characters into the aftermath of the war when they return home in 1919. I had many requests for a sequel to Daffodils and wanted to know what would happen myself. Now I’m writing a third book to complete the trilogy and I even have plans for a fourth. I started off wanting to write about the little Wiltshire village where my children were born. It still had remnants of an earlier, feudal age in the structure of the houses and community and that fascinated me. I was drawn to the era just before all this broke up and, like the characters in the book, was pulled inexorably into WW1. The research took me ten years, off and on, and readers tell me that shows. Finding out what happened to soldiers and their families, shocked me to the core and Daffodils is my personal salute to their bravery and sacrifice. But even after such a global conflict life, for those who survived it, must go on and so I came to write Peace Lily which takes the story into the roaring twenties. 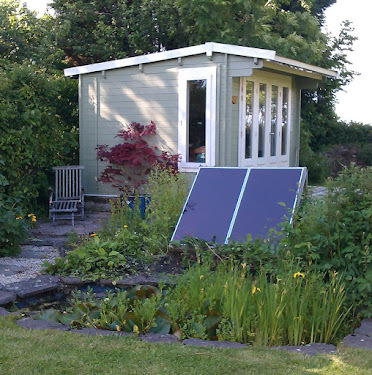 I like writing in my shed in the garden. It’s called ‘The Plotting Shed’ and I have a view of the Welsh mountains from its window. My husband and I built it out of a kit, to save money, but it’s very cosy with great insulation and a bottled gas fire. I light a candle, do an angel card reading, and ‘go under’ into my character’s world. Time passes without me noticing and only when I can’t write any more, do I stop. Oh, so many! Jane Austen, CJ Sansom, EM Forster, Elizabeth Goudge, Winston Graham, Agatha Christie, Georgette Heyer, are the oldies. I’ve read many many contemporary books too which I’ve thoroughly enjoyed and some where I’ve learned what mistakes not to make! Speedwell the third book in the Katherine Wheel Series (Daffodils and Peace Lily are books one and two) which takes Katy and Jem into the twenties and gets them involved in car racing with Douglas Flintock. I’m also embroiled in a ghost story, also set in Wiltshire, which has the English Civil War as a backdrop. It is rich and dark and multi-layered – like a box of good chocolates. I find promotion very hard so don’t feel qualified to advise on this! My books are selling well after changing the categories into Historical Romance and dropping the price of Daffodils. On my last free promotion I gave away 10000 copies of Daffodils, which made me feel a little queasy. I do want to earn my living writing stories but it’s getting harder in an increasingly competitive market. Do it only if you really love it. It’s hard work and the financial rewards are small unless you have a major breakthrough – and I’m not ruling that out! I’m in a small writing workshop – only 3 of us – and it’s the business. We share each other’s work and are ruthlessly critical, mulling over a sentence for ten minutes at a time. Each of them writes work I truly respect and I feel honoured to work with them in this collaborative way. We have many laughs too. One of them has a bestseller and it gives me hope that I’ll make it too. I find it hard to read other people’s work when I’m in a writing phase and am currently reading about twenty research books all at once – so Brooklands Racing Circuit Centenary Book! I really want to get the trilogy of The Katherine Wheel finished by next year, 2015 and then get back to the ghost story, which I’m really excited about. It’s called The Rose Trail and I hope will also spawn a series for the psychic detectives who met by chance. Tough one! A really long one – say War and Peace by Tolstoy, a comforting one like Poldark by Winston Graham, a spiritual one from Elizabeth Goudge and probably Howard’s End by EM Forster.